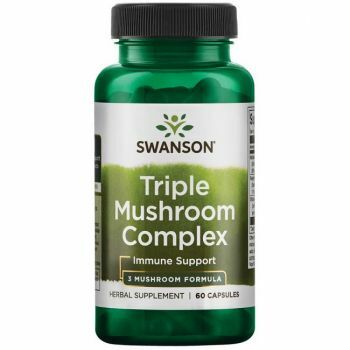 Enhance your immune system function with the natural power of Asian mushrooms! Highly treasured by Asian herbalists for centuries, maitake, shiitake and reishi mushroom are rich in various nutraceuticals which will enhance the natural defence system of your body when you need additional support. This amazing combination contains 200 mg of each of these three types of mushrooms, standardised to contain optimal levels of polysaccharides and other important nutrients. Other ingredients: Maltodextrin, gelatin, microcrystalline cellulose (plant fiber), stearic acid, silica. WARNING: Do not take this product if you are pregnant or nursing. Consult your healthcare provider before use if you are currently taking any prescription medications or receiving any medical treatment. Discontinue use if unusual symptoms occur. Gute Kombination -> nehme das Produkt jetzt schon lÃ¤nger und bin bis dato sehr zufrieden damit!